Meet Rachel Grate, our contributor of the week! What made me want to become a writer: I’ve wanted to be a writer since freshman year of high school, when I had an amazing English teacher who encouraged me. But really it’s been my dream since before I can remember — I was a total Rory Gilmore kid growing up, I brought a book with me everywhere, and that hasn’t really changed since. Music I listen to when I write: The 2005 Pride & Prejudice soundtrack! Fave place to work: Coffeeshops are to die for. My college had a fantastic feminist one called The Motley where I could order my favorite drink and relax on the couch, but sadly I’m recently graduated so I suppose Peet’s will have to do for now. Writers/artists I look up to: Rainbow Rowell, John Green, Sarah Dessen – those are my favorite YA picks. I also love Chimamanda Ngozi Adichie for a current day adult writer. But my all time writing inspiration has to be Jane Austen — she uses humor so subtly that’s it’s just the cherry on top of her fantastic plots and character chemistry. My favorite story (in this it would be cartoon) I wrote/made for HelloGiggles is… I’m torn between two. I probably have to choose what was actually my first article for the site, “Why we need to change how we talk about working out,” mostly because it was so personal and I felt like I really got to connect to the audience. 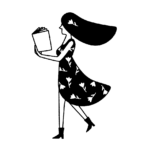 I also loved writing “25 books every girl should read before she turns 25” though, because I’m obsessed with books and giving recommendations for them is one of my favorite things.